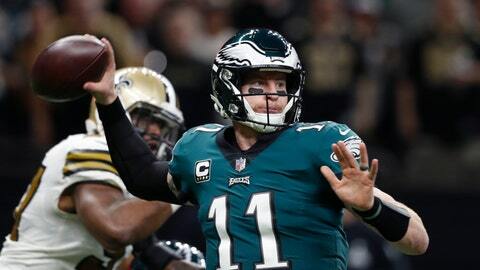 PHILADELPHIA (AP) — The Giants and Eagles are heading in opposite directions in an up-for-grabs division. But the Giants (3-7) have won two straight after a dismal first half and the offense has put up 65 points in those games. Manning is coming off an excellent performance and he’s not hearing any more questions about getting benched. Rookie Saquon Barkley had 130 yards rushing and caught nine passes for 99 yards last month vs. the Eagles. The team’s run defense, which ranked first last year and was tops through the early part of this season, has steadily declined. Ezekiel Elliott had 151 yards rushing against Philadelphia two weeks ago, and Mark Ingram and Alvin Kamara combined for 174 last week. Receiver Golden Tate has only seven catches for 67 yards in two games since the Eagles traded a third-round pick to Detroit to get him. Offensive coordinator Mike Groh said this week it’s been difficult trying to integrate him into the offense.